Michel Legrand who is known for The Umbrellas of Cherbourg and The Windmills of Your Mind provided the soundtrack for Go Between a memorable film starring Alan Bates and Julie Christie, directed by Joseph Losey and Harold Pinter. It was clearly a time to learn more about Michel Legrand and found another fact that seems to shed important light to history of 20 Century music. Recently I learned that Michel Legrand studied compostion under Nadia Boulanger who seemed to have taught some of the important composers of the 20th Century such as Aaron Copland, Virgil Thompson, Elliott Carter, Quincy Jones, Michel Legrand, and Philip Glass. These two sisters made an extraordinary impact on French musical life, Lili being the first woman to win the much coveted Prix de Rome, and Nadia becoming perhaps the most influential musical teacher of the 20th century. 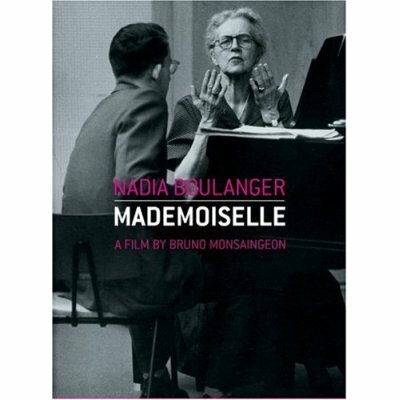 Madmoiselle focused on Nadia Boulanger as a teacher. The film does not provide biographical information and says nothing about her sister. Leonard Bernstein speaks fluent french in this film. He facetiously calls her followers the Boulangerie (French bakery). Nadia Boulanger was born in Paris. Her emotional life was largely centered around her love for her sister, Lili Boulanger, who was six years younger, and whose care Nadia had been entrusted with by their father. Lili was one of Nadia’s first composition students, and it was largely under her guidance that Lili won the Prix de Rome, in 1913. Related link: two sisters as musicians Jacqueline du Pre. This entry was posted on Thursday, March 11th, 2010 at 1:16 pm	and is filed under Cinema, Culture, Music. You can follow any responses to this entry through the RSS 2.0 feed. Responses are currently closed, but you can trackback from your own site.